Children can become frustrated for a variety of reasons, and a stress relieving ball or toy to squish, squeeze, and knead can be a great tool to give your child. In the same way an adult would tightly grip a stress ball rather than slamming a fist on their desk or muttering expletives, a child can release their frustration with these fun tools. Squeezing a stress ball is a great way for a child to release the built up energy in a non-destructive way. This sensory item will also help a child integrate their experiences of emotions and what they are feeling in their body. Releasing the stress ball will help teach the child how to relax their muscles and eventually calm down. Squeezing and releasing the stress ball can also be paired with deep breathing techniques to more fully allow the child’s body to slow down and become more relaxed. Involving your child in the process of choosing or making their stress relief object can encourage more ownership of it, and they will be more interested in using it to calm down. Plus, it’s fun! Here are a few tips on how to help your child make their own stress relief ball. It’s a good idea to do this craft at a kitchen table, or somewhere else where it will be easy to clean up. Get a few balloons and some white flour. A funnel is really helpful, but a piece of paper rolled into a cone will work in a pinch, too. Depending on your child’s age and motor skills, you can have them as involved as you (and they!) can handle. A younger child can pick out the balloons at the store and watch, an older child may be able to hold the balloon or pour flour in the funnel, and some will even be able to do the process start to finish. Simply hold the funnel through the neck of the balloon and slowly fill with flour. Have your child give a few test squeezes while you hold the top shut. The more ownership they feel, the more likely the tool will be useful. When you reach the desired feel, tie a knot in the balloon, just as you would if you had filled it with air. For more boisterous children, it’s a good idea to pull a second balloon over the first. Now that you have this helpful creation, it’s important your child knows when to use it. Talk to your child’s counselor, therapist, or psychologist about teaching your child to recognize the appropriate emotions and times to use their new stress ball. They will be able to share with you the feeling words they use, so you can reinforce therapy at home. Note: If someone in your family has a latex allergy, or if you lack the crafty gene, a great alternative is to look at fairs, conventions, or anywhere else you see promotional materials. 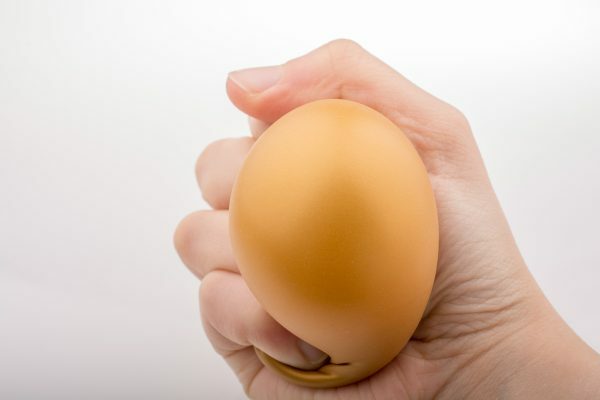 Stress relievers are a common, low cost marketing tool used by small businesses and are often given away at trade shows, festivals, and other events. Grace Counseling has them, too! Just ask your counselor or ask at our front desk.